Atal Bihari Vajpayee’s cabinet had stalwarts with strong views and even stronger mannerisms. The youngest minister, Ananth Kumar, marvelled at their knowledge and at the forcefulness of their arguments. He was also a good mimic of how each of the big guns would boom, and how Vajpayee would control them by just raising his eyebrows or by nodding towards his number two, L.K. Advani, to sum things up. There was Jaswant Singh, who would speak with the grace and etiquette of a British parliamentarian; Ram Jethmalani, who would thunder out his arguments; the professorial Murli Manohar Joshi would take a mini class; and then there was the sharp-tongued Yashwant Sinha and the quick-tempered George Fernandes. For the young Ananth Kumar, it was real-time learning in governance from those who had spent long years in Parliament. Ananth Kumar spent 22 uninterrupted years in Parliament, nine of those as minister handling second-tier ministries like civil aviation, culture, sports, urban development, fertilisers and parliamentary affairs. When he was not a minister, he was a powerful presence in the BJP headquarters as a general secretary handling the critical central Indian states. He was one of the youngest members of the BJP’s powerful parliamentary board. He aspired to be the ultimate organisation man, crisscrossing the country and building contacts everywhere; a trait he picked up from his student days, working for the Akhil Bharatiya Vidyarthi Parishad. As his friendship with B.S. Yeddyurappa turned sour, he felt he was being marginalised in Karnataka. When Yeddyurappa was asked to resign as chief minister in 2011, he extracted a promise from the high command that Ananth Kumar would be kept away from state politics. He remained confined to his parliamentary base in Bengaluru till Yeddyurappa left the party. He was one of the contenders for the national presidentship of the BJP until the new RSS boss, Mohan Bhagwat, declared that none of the Delhi Four (Venkaiah Naidu, Sushma Swaraj, Arun Jaitley and Ananth Kumar) would become president, and brought in the outsider, Nitin Gadkari. But, in 2014, when Modi was forming his cabinet, the same RSS insisted that Ananth Kumar be made a minister. Modi agreed, but he did not acknowledge Ananth Kumar’s seniority and give him a major portfolio. With his famous survival instinct intact, he worked hard in the ministry of chemicals and fertilisers. Ananth Kumar’s success in implementing the medicines at doorstep programme earned him brownie points. He was rewarded with the portfolio of parliamentary affairs, where his networking skills enabled more legislation to be cleared with a fractious opposition. 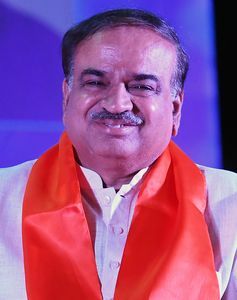 Yet, Ananth Kumar knew that the three major deities of power—Lakshmi (economic portfolios like finance, commerce and railways), Saraswati (human resource development) and Shakti (home and defence)—had eluded him, although some had even gone to newcomers like Nirmala Sitharaman, Smriti Irani, Sadananda Gowda and Manohar Parrikar. But he worked tirelessly. He had a way with difficult files. He would not write strongly-worded notes or allow his officers to do so. Instead, he preferred long meetings to hammer out a consensus, sitting late into the night. For a man who avoided foreign trips as minister for chemicals and fertilisers, it was sad that Ananth Kumar’s last journey abroad was to get treated for a deadly disease. The disease did not spare this extraordinary organiser, raconteur, public speaker and generous host, and took him away before he turned 60.